Let’s take a look at the classes provided through the API which enables us to monitor the current network connection on a device. The ConnectivityManager is a class which provides information on the current network connection (i.e. whether there is a connection and the type of connection), monitors for network connectivity changes, and broadcasts a connectivity action when any connection details have changed. The BroadcastReceiver is a base class that will receive notifications in the form of intents when another application or the system triggers the SendBroadcast(Intent) method. An intent will contain an action string and optional data that will be received by any applications that are registered as receivers. Next, you must extend the BroadcastReceiver base class and override its OnReceive(Context, Intent) method. You can check the intent’s Action to determine if and how you will respond to the broadcast intent within your own application. The Connectivity Plugin contains the necessary code for retrieving information about the network, monitoring for network connections and listening for connection changes. The best part of this plugin is that it is a complete cross platform solution, so that you can use it in your client applications and Portable Class Libraries. He has provided both the abstraction layer and the necessary platform-specific implementations (ie. Android, iOS, Windows 8.1 and Windows Phone (8.0 & 8.1)). The Connectivity Plugin handles loading the platform-specific implementation logic. All you have to do is make the appropriate calls through the plugin’s IConnectivity interface which is exposed through the CrossConnectivity.Current static property. At runtime, the Connectivity Plugin will load the platform-specific implementation and make it available through CrossConnectivity.Current. This may not seem like a big deal now, since we are only targeting Android. But if you ever wanted to expand your application to target multiple platforms, you will realize a huge time savings from only having to call one API rather than code each platform’s implementation to achieve the desired result. James has made the entire solution for the Connectivity Plugin available on his Github account. Feel free to peruse the code or download it and customize it for your needs. Side Note: When using 3rd party components, be sure to provide proper attribution within your application – for example: by adding a Credits page that lists the components you used, along with their respective authors. These components are provided by developers to make your life easier, so it’s important to give credit where credit is due. To add the Connectivity Plugin to our application, right-click on the project in Solution Explorer, and select Manage Nuget Packages. Within the Manage Nuget Packages dialog, search for Xamarin Connectivity. Install the Connectivity Plugin for Xamarin and Windows. Once the Connectivity Plugin has been added to the project, take a look at the project’s references. Notice that it added two new references to the project – Connectivity.Plugin and Connectivity.Plugin.Abstractions. Be sure to unregister the event handler in the OnStop method as well. Next, we need to include the action we want taken when the network connectivity changes. In this scenario, we only care about whether or not the video can play. Since the LaunchVideo method is responsible for starting the video playback, let’s include a check to only start the playback if the network is currently connected, so that no matter where it’s called from, we are performing our due diligence. I am also going to ensure that the video player isn’t in the middle of playing the video already since LaunchVideo is called from multiple locations. Then in our OnCurrentConnectivityChanged event, we can simply call the LaunchVideo method as is, since it’s already checking to ensure an active connection before playing the video. Alternatively, you could check the state of the connection within this event handler through the ConnectivityChangedEventArgs.IsConnected property. It’s up to you, whichever way you prefer to handle it. Now, we want to be able to display a status message when the network connection is lost. Let’s add a TextView to the MainActivity layout. 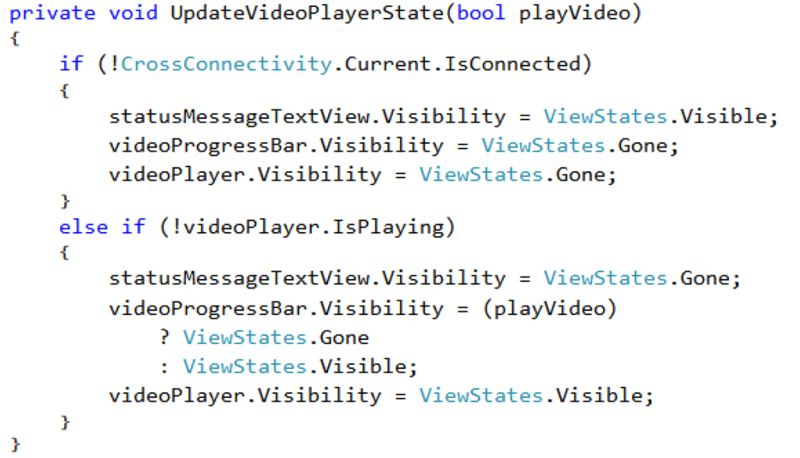 With the TextView in place, we now need to ensure we set the view states on the VideoView, the ProgressBar and our new TextView based on connection state. When there is no network connection, we want only the status message (ie. the TextView) to display, otherwise it is hidden and the ProgressBar and VideoView will display. Again, note that we are also checking to make sure the video player isn’t in the midst of playing the video, since this method is also called from multiple locations. Tip: If you’re wondering why we do not set the VideoView’s Visibility to Gone or Invisible when the ProgressBar is displayed, it is because it will not fire events when hidden. Since we are listening for its Prepared event, and rely on that to determine when to start the video playback, we need to ensure it remains Visible in this scenario. Now we can simply add the call to UpdateVideoPlayerState, passing in a false value when the video player activity first starts, when the configuration changes or connectivity changes. Last but not least, don’t forget to modify the AndroidManifest.xml to register a broadcast receiver and to request permission to access network state as we discussed earlier. Replace the checks from CrossConnectivity.Current.IsConnected to IsConnectedToWiFi. At this point, you can run and test the application. Play around with turning on/off WiFi connections while the video is loading and while the video is playing to see what happens. I know you will find more ways to improve upon this sample application just by testing it out. I hope this gives you a good starting point to work from. You can check out the completed project on my Github account.